Product prices and availability are accurate as of 2019-04-19 16:16:34 EDT and are subject to change. Any price and availability information displayed on http://www.amazon.com/ at the time of purchase will apply to the purchase of this product. At age twenty, Suzy Hansen’s life changed. On a lonely country road in broad daylight, her car was engulfed by a massive ball of white light, resulted in ninety minutes of missing time and the unfathomable experience of “waking” after dark. This riveting experience led to her discovery of an alternative reality – time spent with extraterrestrials on-board their craft since childhood, and in fact, since her inception as a soul. 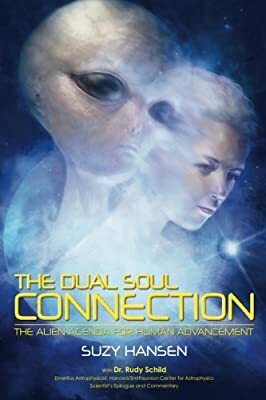 The Dual Soul Connection – the Alien Agenda for Human Advancement, uniquely combines absorbing details of the life-long alien encounters of UFO researcher and experiencer Suzy Hansen (NZ), with scientific examination by Dr. Rudy Schild, Emeritus Astrophysicist, Harvard/Smithsonian Centre for Astrophysics (USA). Hansen and Dr. Schild address such issues as alien culture, spirituality and consciousness, alongside scientific concepts of advanced physics and organic “conscious” technology – all within the framework of Hansen’s contact with these non-human species. Significantly, the book outlines human participation in complex alien programmes that assist and advance humankind, and Hansen’s experience of a dual soul identity central to this positive agenda. Hansen’s clear empirical approach gives the fullest description of how this off-planet civilization seeks to prepare us for contact, and answers the “why” question by describing in detail the “how”.